6 nights accommodation with breakfast, route notes, maps and luggage transfers. Local support 24/7. 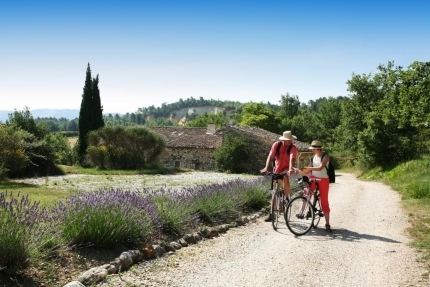 Provence is perfect for those with passion for discovery. One of the joys of travelling here is touring the back roads and soaking up the stunning variety of landscapes: fields of lavender, ancient olive groves, stunning vineyards, multihued hills and even snow-tipped mountains. It is home to France's deepest canyon, picturesque villages, and miles of quiet country roads, all a dream come true for cyclists. This landscape inspired great painters, and is a joy to travel through, especially in spring and fall when the climate is perfect. Discover Roman ruins, châteaux, abbeys and castles. Taste the wine and sample the wonderful cuisine of the Provencal region. Explore Saint Remy and the medieval village of Les Baux de Provence. Then ride to Oppede and Rousillon, considered to be one of the most impressive villages in France, strategically situated at the foot of the “Monts de Vaucluse”. The bike tour ends in a charming Provencal town, Isle sur la Sorgue. You will understand why with its numerous canals and branches of the Sorgue have given the town the nickname of the Little Venice.